RIM has finally seen sense and is working to bring voice to its BlackBerry Messenger (BBM) service according to the Verge, which reports that a beta is live now with a view to a full rollout by the end of the year. It’s a move that’s been welcomed by many but its one that has come too late to make a big difference and the struggling Canadian firm could certainly have acted sooner. Let me explain. There was a time when BBM was a huge deal. For people buying new smartphone, it was a factor that could sway them into buying a RIM device over a rival phone, simply because of the chat platform. But, those days are fading. Times have changed, and BBM is no longer unique nor is it something that makes people buy a BlackBerry over an Android, Windows Phone or Apple device. While RIM is right to add voice, it has lost a considerable advantage by moving so late. Had it announced the feature a year ago, for example, it might have picked up greater momentum as an early mover, but now, it will likely be little more than a nice addition for existing BlackBerry users or RIM fans. In Asia in particular, where RIM holds significant market share in a number of countries, such as Indonesia, cross-platform competitors have been offering voice over IP (VoIP) calling for some time. Japan’s Line has featured free voice calls from its inception last year, while Korea’s Kakao Talk and China’s WeChat added the feature in May and in July respectively. RIM says it has more than 60 million BBM users, 70 percent of whom use it daily, but those figures are not much ahead of the new kids on the block. Line has 70 million, Kakao Talk 65 million and WeChat more than 200 million, and that’s without counting market leader WhatsApp which, though popular worldwide, doesn’t reveal its figures. These firms are lasering in on promising growth markets like Indonesia, Thailand, Malaysia, India and the Middle East, building compelling chat apps that go beyond messaging and also link up to social networks and apps with big brand support. This is a real challenge for RIM since these are the very places where BlackBerry holds its strongest market share. The range of pricing and choice of Android phones is challenging these strongholds and an earlier introduction of voice for BMM could have made a huge difference in these crucial spots. It isn’t just the up-and-coming new Web startups either; RIM’s rivals Apple (iMessage/FaceTime), Samsung (ChatOn) and Microsoft/Nokia (a new Skype for mobile) are all offering free calling. RIM is, ironically, the last to embrace voice calling, despite first leading the way. So while T.A. McCann, RIM’s VP of BBM and Social Communities, may tell the Verge that RIM “pioneered [mobile chat] and is now being copied by many”, that matters not since BBM platform is being out-innovated by its competitors and a bunch of fast-growing, young startups. 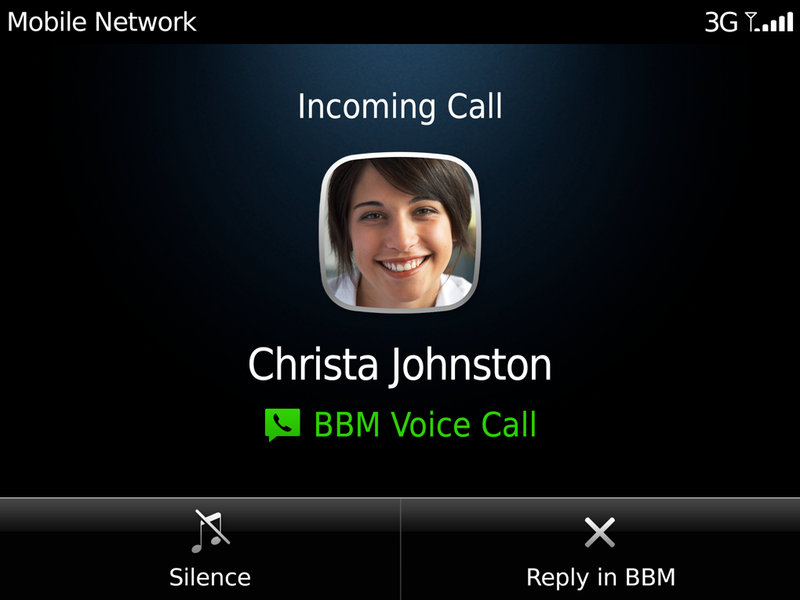 To its credit, the Canadian company is working hard to link BBM up with the rest of its ecosystem, it is merging BBM IDs with BlackBerry IDs and integrating it with social apps, but the early headway it made has been cut into in a major way. RIM has finally revealed the launch date for its BlackBerry 10 devices, which will go on sale in February, but the company has moved too late on a feature that could have give a real boost at a time when it needed, given the continued stalling of the BB10 launch. Mobile messaging apps are emerging as a real threat to social networks among smartphone owners, but the company is only just playing one of the last aces that it still holds.